Allie Schweigert of Bourbonnais, Illinois, will graduate from Bethel College, Mishawaka, Indiana, with the Class of 2021 with a bachelor’s degree in accounting and Spanish. 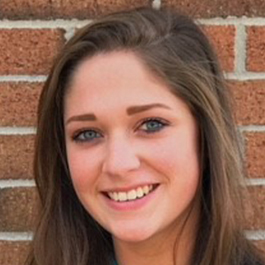 Allie started interning at the Everence® headquarters in Goshen during the summer of 2018. What did you do in your internship? I assisted Audrey Miller in the Michiana Office with several organization tasks. The most significant being updating the company CRM database and planning and executing an Everence branch awareness campaign at the Elkhart County 4-H Fair. What did like the most about your internship? I enjoyed exploring and learning about the many different facets of business within Everence. I was able to shadow employees in several other departments and learn about the opportunities in each. What is the most valuable thing you’ve learned throughout your internship? Beyond the basics of financial planning, I gained knowledge about leadership and professional development, as well as better understanding of what I would like in my future career. This was a great internship to have because it gave me the opportunity to explore different fields in business and make personal connections with professionals. Students from colleges and universities across the country are welcome to apply for a paid internship at Everence for the summer or during the academic year. Let us know if you'd like to be considered for an opportunity in your area of interest. To learn more, visit everence.com/internships.